Sorry - still no new review posts and it won't be coming in the next week as I'll be travelling for most of this week. Hopefully I'll manage to sneak at least one but maybe two, up on the blog during March. Watch this space and hopefully it'll happen! Telestrations: Just the one game night this week and just the one game played. In a way Telestrations is more of an activity than an actual board game, but it doesn't matter. There is a couple ways to keep score and have a winner, but really its just best played for a good night and a few laughs. Highlights were 'Cheese' turning into 'Dog In A Jumper' and the another started as something like 'Bread' and after changing about 4-5 times it ended up on 'Car Door'. A quick side note - I have the party edition that plays with 12, and if you can manage to get the full 12 the drawings can end up like anything! For competitive players, there isn't really anything on offer with Telestrations - but if you have a random group of people some who don't usually enjoy a board game then Telestrations is an excellent choice to pull out. 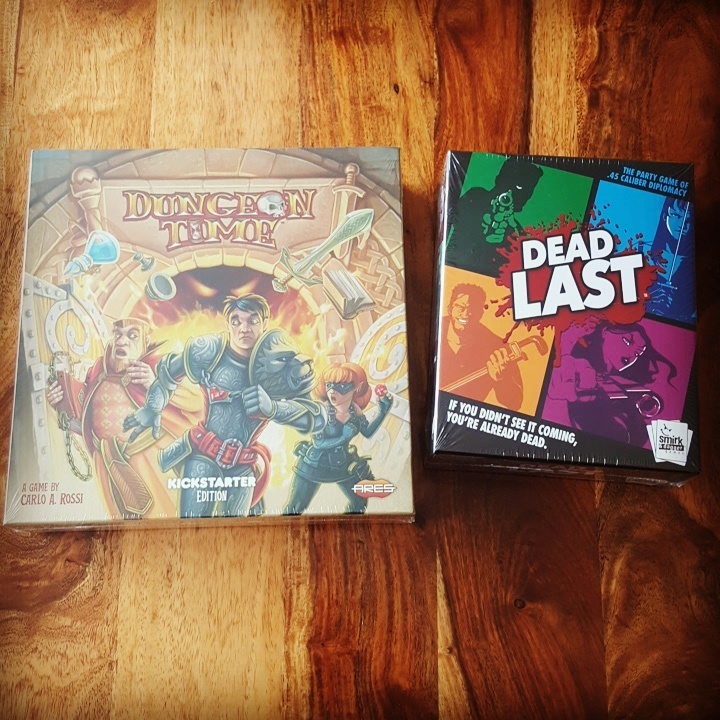 Dungeon Time: Being fairly competitive means that Co-Op games aren't really a favourite of mine. However something about Dungeon Time piqued my interest and became only my second kickstarted board game. My initial thoughts just going through the components are a little disappointing. Ares were kind enough to throw sleeves into the kickstarter versions of the game, but they didn't design the box insert to actually fit the sleeves? A tiny bit of forethought would have been nice. Aside from that everything looks well made and designed so hopefully somewhere down the track I'll get some enjoyment out of this. It could be a while though as I'm not in a massive rush to get this one played as there's still a fair few waiting in the pile above it.